Day 1 dawned, and we finally got started on Live Below the Line, feeding ourselves on £1 each for 5 days. 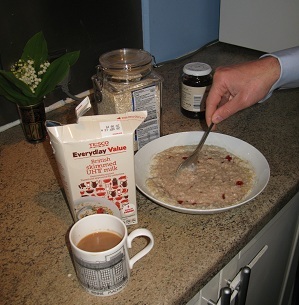 At first sight, my breakfast on day one of Live Below theLine is the same as normal: a cup of tea and a bowl of porridge. The reality is that the tea is made from a value tea bag,rather than the Earl Grey I’d prefer. I’m cautious about adding too much milkas we’re likely to run out later in the week. I eat more porridge than normal, as I can’t bulk it out with my accustomed banana or raisins, both of which were beyond my budget this week. Instead, I add a dollop of value strawberry jam, with noticeably lower fruit content. Even the porridge itself tastes different, as I’m used to adding semi-skimmed fresh milk rather than a UHT skimmed version. One meal down, and I’ve already had to make multiple trade-offs that aren’t quite what I’d like, as nice as I’d like or as much as I’d like. Yet again, I’m grateful this is only temporary, rather than the continual grinding reality for so many others. For lunch I tried out a version of Jack Monroe’s “Carrot, Cumin and Kidney Bean Burger” recipe. I say only a version, because I substituted garam masala for cumin, only had the carrot, onion and kidney beans, and had to do without coriander, oil and flour. Suspect the suggested mango chutney would indeed have made all the difference, but it stayed resolutely in my store cupboard rather than on my plate. I had to cook the burgers, rice and soup the day before, so my husband could take his food into lunch. Living Below the Line doesn’t allow the leeway to grab food when you’re out and about. 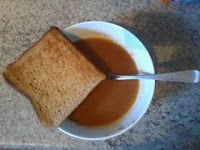 One of the trickiest times of day for me is when my children are eating their evening meal, so I waited until then before eating my curried carrot soup and a piece of dry toast. only hope my will power extends to the end of the week. 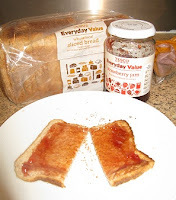 I also had a slice of toast with some more of the value jam. I figured our will power and enthusiasm would be highest on the first day, so cooked entirely vegetarian meals with a double dose of rice for both lunch and dinner. Dinner was Chickpea and potato curry, inspired by Penny’s Recipes. I used half the tin of potatoes, as cheaper than ordinary raw potato, stuck in a single tin of tomatoes, used garam masala rather than curry paste and substituted frozen carrot for frozen peas, as there are more carrots than I know what to do with in the mixed veg bag. With no oil to cook with, I’ve been dry frying onions in a non-stick pan, then adding a little vegetable stock to make really sure it doesn’t stick. It tasted better than I expected, and was very filling – which was a relief, because we’ll both be eating it again for lunch on Day 2. I drank another couple of cups of tea with a dash of milk during the day, adding another 2p. I was fund raising for Unicef at Live Below the Line, the global poverty project, but the donations page is now closed.